Brief Synopsis – Michael Moore decides to take on the Health Care system and try and figure out who is benefiting the most from health care, the providers or the patients. My Take on it – I have always been a fan of Michael Moore, because he is such a great investigative film maker. I may not always agree with his politics and many of his films have a large liberal skew on the subject matter, but he still does a great job presenting the issues. This film is all about the Health Care system in the US which was a mess and this film is able to show many of the flaws in the system. He is an expert interviewer and always is able to give us some great interviews with people willing to talk to him and also with those unwilling to do so. Watching this film 12 years after it was made begs the question as to whether the enactment of ObamaCare during those intervening years actually was able to change the system for the better and I’d love to see a follow-up by him on this issue to see whether he was able to get what he wanted and whether things truly meet his standards and expectations. Some of the stories told here are extremely eye opening and scary to think about and I’m so glad that I got to see this film. Bottom Line – Moore does it again. He manages to give us an insightful film that even with his political skew on things still is able to unearth some very large flaws in the system. He is always able to get some great interviews with people who are wiling to talk with his and others who will do all they can to avoid doing so. 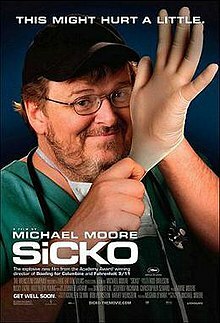 The Health care system was definitely broken at the time this film was made, but he still needs to make a sequel to show if things improved under ObamaCare or not because he more or less got what he wanted but the question remains as to whether is truly met his expectations and standards. Highly Recommended!